This salon quality Chlorine-Out Shampoo contains Organic Aloe which is a popular botanical used for its moisturizing, soothing and calming properties. Formulated with our 5 sequesting agents and a light citrus scent, TRISWIM Shampoo also contains Vitamins E & A, and Pro-Vitamin B5, which also helps remove copper deposits that can cause some hair to take on a greenish tint. Gently removes chlorine and chlorine odor. 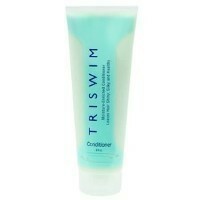 TRISWIM Shampoo is safe to use on permed and color treated hair. 8 oz.